At the beginning of the summer, I made a list. A pinterest inspired wall of white cardboard and polka dot washi tape. And to this ‘list’ I added every last activity I could think of, that might see us through 68 days of summertogetherness. Play Date. Library. Go to the Movies. That sort of thing. And, in a moment of use-what-you-have-at-your-disposal-ness, I pulled out the Calgary Hikes book the professor received when he began working here. And I added ‘Do a hike from the Calgary Hikes book’ to my list. So on Sunday, having gone 30 days without doing any ‘Calgary Hikes’, I handed the professor the book and told him to pick one for the five of us. 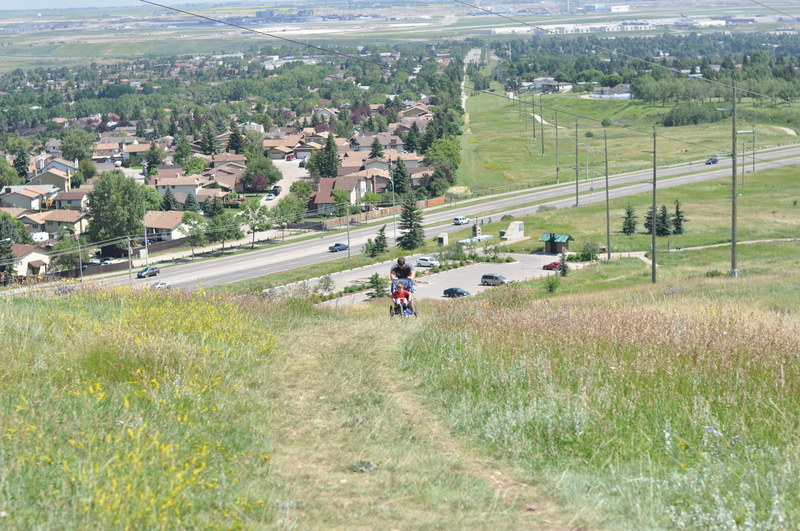 His criteria were (1) absence of mosquitoes and (2) something under 7km, so he settled on The Nose Hill Hike. 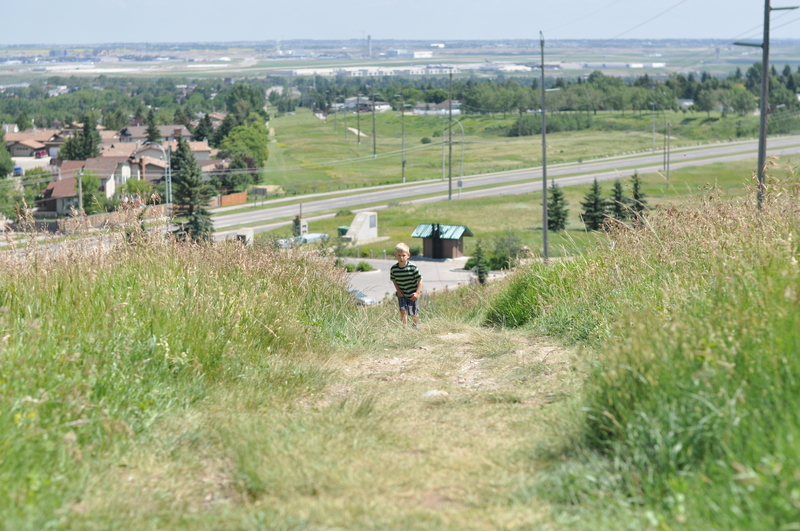 I’ve lived in Calgary for nearly 4 years and have frequented many of Calgary’s large parks, but have never gone to Nose Hill. For some reason I can’t psych myself up to ascend a tree-less grassy knoll for sport. But the decision had been made for me. 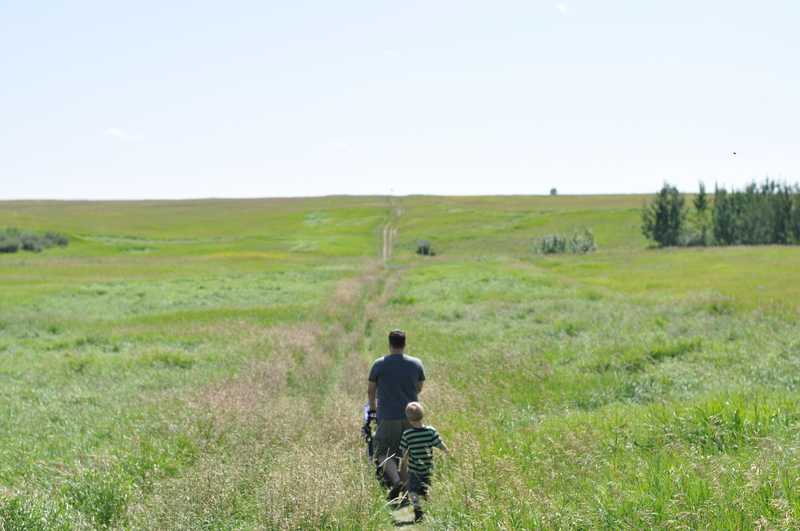 My stand-off with Nose Hill was about to end. This would be a perfectly acceptable preference if it weren’t for the fact that any time I suggest we go for a bike ride, he declines, saying he’s ‘too tired’ or ‘not in the mood’ or ‘maybe later’. Hence we approached said grassy knoll with tepid expectations. 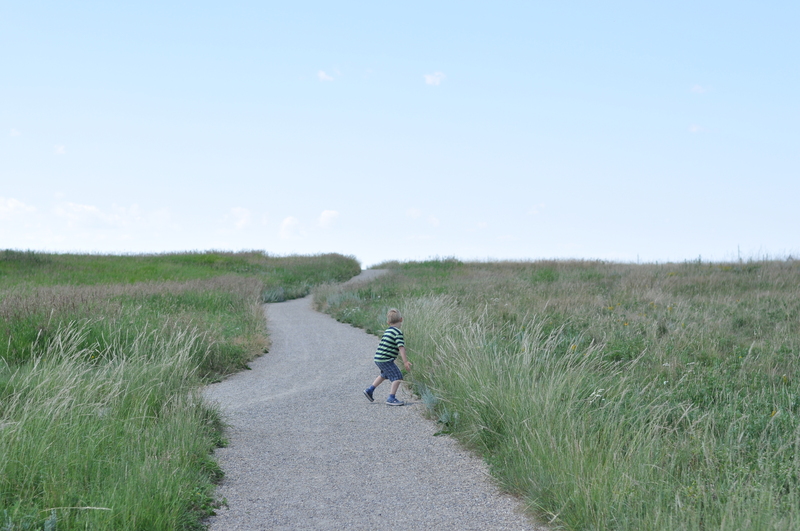 And with unhappy children, jogging stroller, water and snacks in tow, we began the [rather arduous] ascent. Once we’d reached the summit, I was pleased to discover it was a nice grassy knoll. Rather Provence-esque but without all the lavender and je ne sais quoi. We passed a few empty-nester couples going for their Sunday strolls. They beamed at our little family, as if to say ‘those were the days’ and I couldn’t help but think: selective.memories! I take a modicum of comfort in the fact that they complain now but some day, when they have children of their own, they will most likely take them on the much-despised family walks. Tell the boys they can call their auntie to commiserate. We’ll save a spot for you on our next hike! 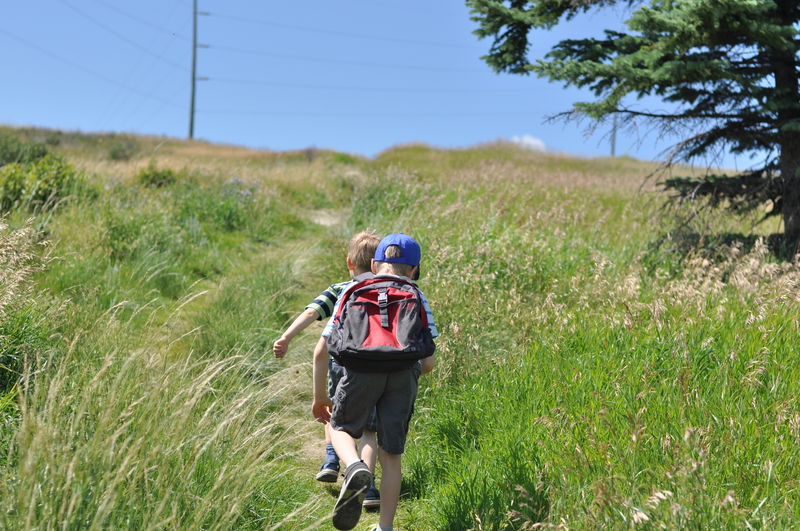 We geocache….that way the kids can find ‘prizes’ when they hike. Hey, don’t judge me, I am not above bribery if it suits my purposes! Kristen – I’m all about the bribe. Geocaching is on my ‘list’ for the summer.